What is orthopedic robotic surgery? Orthopedic robotic surgery is a minimally invasive approach to orthopedic surgery using state-of-the-art robotic instruments. Instead of one large incision (as with traditional surgery), your surgeon will operate through a few tiny ones—allowing for faster recovery with less pain, scarring and blood loss than regular surgery. Orthopedic robotic surgery may be an option if you’re not a candidate for traditional surgery. Mako Robotic Arm—A surgeon-interactive robotic arm that enables highly accurate hip and knee implant placement. 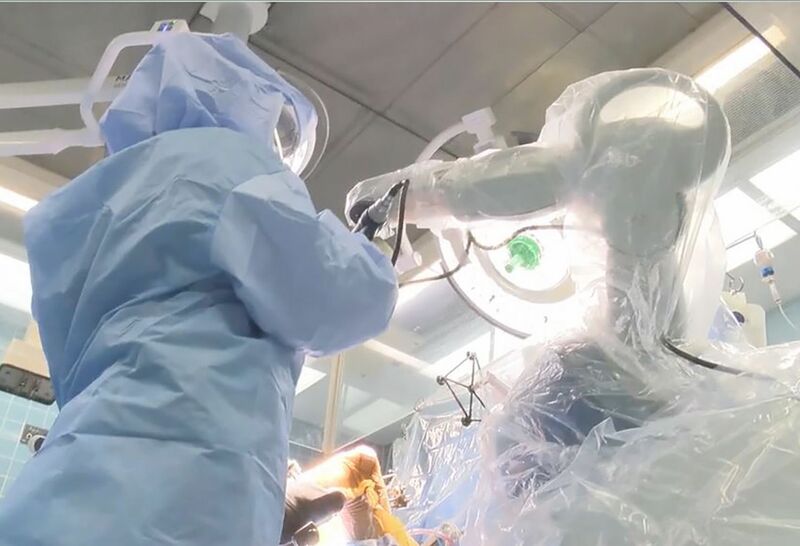 Navio Robot-Assisted Surgical System—An image-guided system with handheld instrumentation to help surgeons deliver robotic precision during partial knee replacement surgery. Orthopedic robotic surgery can be performed in place of traditional surgery for hip and knee replacements. However, the most common robotic orthopedic procedure is partial knee replacement. Although total knee replacement is the most common knee replacement surgery, robotic partial knee replacement—using either the Mako robot or the Navio robot-assisted surgical system—is an option for some patients. This minimally invasive procedure is performed through a limited incision using a robotic guidance system to remove and resurface only the arthritic part of the knee while preserving healthy portions of the knee joint. Our surgeons bring the most advanced orthopedic procedures, backed by Northwell Health’s own extensive research studies, to the operating room every day. Dedicated to ongoing innovation, our orthopedic research scientists and practitioners are constantly offering hope for patients with chronic hip and knee pain. Our joint replacement surgeons are experts in minimally invasive techniques, which use specialized surgical instruments through small incisions. In some cases, our specialists can perform surgery via a robotic surgical system that allows them to operate more precisely. Watch robotic assisted technology for joint replacement.